Welcome to the March Foodie Pen Pal Reveal Day! Charmine. She is a Super Mom. She is a woman on the go who loves to stay active and healthy. She lives in California! Oh what I wouldn’t give for a bit of their sunshine and warmth. Here’s what she sent me. I love the Annie Chun’s food line, I am a huge fan of their soups and noodles, so I am really excited to try the Seaweed snacks and the ramen noodle packages that Charmine sent. Plus she sent me some fruit leather and I am a huge fan of all fruit leather. Also included in the box was an assortment of coffee samples, organic nuts from Oregon and some barbecue sauce. I don’t drink coffee, but I know I can pack these on a trip I have coming up and share with some of my coffee drinking friends. Five cans of tuna. I love tuna, I mean I absolutely adore tuna, and these were packaged from a deep-sea fishing trip Charmine and her family had in San Diego. I am beyond excited to break them open and make a huge pan of homemade tuna noodle casserole. The idea of this being fresh caught tuna that was processed and canned makes this Foodie Pen Pal, ONE Happy Girl. Thank-you so much Charmine, I love me some tuna, and you sure did stock me up. Sydney over at Alternative Vegan. I was so excited to send to Sydney. This is the 1st. Vegan I have been paired up, and I have been doing the Pen Pal exchange for over a year. I love her story on becoming a Vegan. I am not Vegan, but I strive to be more conscious everyday with my choices. 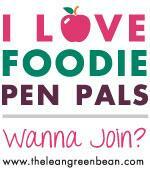 Interested in the Foodie Pen Pal Program? Well here is the ALL the information about the Foodie Pen Pal Program. Welcome to the February Foodie Pen Pal Reveal Day! This month I received my box from: Meg at Meg Vs Chub. I also received my January box from Meghan. I don’t think that this happens very often, because there are so many participants in the Foodie Pen Pal Exchange, and since people are randomly paired together. I thought it was really cool and since I loved my January Foodie Pen Pal Box I looked at it as another opportunity to get to know Meghan that much more….If you read January’s post then you know that I love her tag line: Screw You Chub, Get Outta My Way. It’s just such a strong and bold tagline. She also makes the BEST card to send with the Foodie Box. So this months card looks like this. This is the back of the card. The front of the card. So cute and is truly how I feel about food. So on to the Revel. Check out my box of Awesomeness. It has such a wonderful variety, and with new things I have never tried before, I really love that. She also sent my babies a treat. Boy did they love that. These are homemade treats and my “kids” went nutz for them. Stuart was licking the bag! Ginger was patiently waiting her turn. Meghan, my little “kids” LOVE you for thinking of them, and thank-you for the yummy treats. They felt really special getting a treat in the Foodie Box! Now back to what I received. I am really excited to try the PB&J bar from Trader Joe’s. Plus this fun Greek Yogurt Granola Bar. I just cannot get over how excited I am about breaking into all my goodies. Thanks Meghan! I really enjoyed spending the last two months with you as my Foodie Pen Pal. You’re a real sweetheart and I love your choices in food and snacks. I also wanted to Congratulate Meg on her weight loss success. On her blog she posted a Progress Picture and her weight loss to date. Amazing Progress Meg. You really accomplished so much and I find it so inspiring how you changed your health and your life. I sent February’s Foodie Box to Tracie who is a reader of Foodie Blogs. I had a good time getting to know her via email. She has 2 little kids ages 11 and 6. She also has 6 dogs and 3 cats. She loves fitness and good food. Sounds like she is getting ready to start her own blog sometime this year, and I for one cannot wait until she does! I’m also hoping she will Guest Post for me and share her love of travel, food and her family. It’s Reveal Day, Happy Foodie Pen Pal Day! So just a quick note about the Foodie Pen Pal Program. 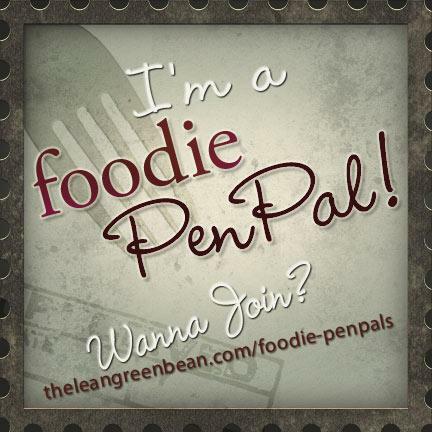 I just want to start by saying that ANYONE can join in the Foodie Pen Pal Program, it is open to readers and bloggers. It’s so much fun, you meet so many great people and get some really tasty food and snacks. For more information about the Foodie Pen Pal Program, please see the end of this post. Okay, now on to the Reveal. I took a few months off from the Foodie Pen Pal Program over the holidays, I knew I just could not commit to adding one more thing to my to-do list, but as soon as my schedule returned to normal, I knew I had to sign back up. I am so happy to be back, I missed this program, it really is so much fun and I love meeting other bloggers and readers. So this month I received my box from Meg at Meg Vs Chub. I love her tag line: Screw You Chub, Get Outta My Way. Now to the goodies: Herbal Pop Corn and some Imported Italian Pasta, I cannot wait to try the pasta with a homemade pasta sauce recipe I have been working on. I also see the popcorn going down with a Netflix Movie, a warm blanket, and a beer on a Saturday night. Some local Maine Crystallized Ginger, Dried Kiwi and Bay Leaves. and, this little jar of love. Pure Maple Syrup. I am planning a special french toast breakfast for this. I think it will be amazing warmed up and drizzled over some baked berry french toast on a cold Sunday morning. I plan on searching the internet for the perfect recipe. I love it when a food item inspires a great meal, plans and something to look forward to. Meg sure did supply me with a clear vision of what to do with my goodies. Now back to this little container. Dried Kiwi. How cool is that? Well they were as delicious as they look. I love dried fruit, it always makes a great snack, and I had never tried dried Kiwi so I was happy that it was in my box for me to try. My husband also enjoyed them. Thank-you Meg for a great box of goodies and inspiring some future meals. Between the pasta and the maple syrup and all the snacking YOU sure did make the January box a highlight to my New Year. Much appreciated Meg. I sent a box over to Darlynn at The Little Blog Dress. Picking out items to send to a Foodie Pen Pal is just as much fun as receiving a box. Head over to her blog to see what was in her box! Hey Fellow Foodie Pen Pal’s, don’t forget to tweet using the hashtag #foodiepenpals. Interested? Well here is the ALL the information about the Foodie Pen Pal Program. It sure gives you something fun to look forward to each month. 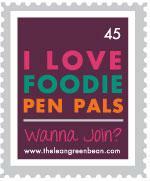 Hello, Hooray, its Foodie Pen Pal Day! August Foodie Pen Pal Reveal Day is here, and I am so happy to share with you what I received, but first I want to introduce you to my sender Anna. Anna has a blog called Little Bay Stampin’ and her tag line is: a little blog about paper, food, and family. set in the charming Cape Cod town of Orleans. perpetually covered in cat fur. So now to the goods, Anna made this lovely card. She stamped the flower jar and tied a little burlap bow on it, and added all the paper elements to the card. I love it, she clearly is talented and creative. Plus the note she wrote was great, she described all the items in the box. She’s from Cape Cod and has relatives in Michigan. Turns out her grandmother lives in a town just a few miles away from where I grew up. Talk about a small world. Here’s all the items from the box. I think I have an amazing box of goodies. Plus she was so thoughtful and sent me some dog biscuit’s she found at a local farmers market. Killian and Stuart loved them. They were very happy that they got a treat out of mommy’s foodie box. Yep, they call me mommy! Here’s Killian enjoying his Beach Dog Biscuit. On a side note, He’s one good-looking little red dog. Now to Stuart enjoying his treat. Again, on a side note, He’s got a face I could kiss all day. Killian and Stuart devoured those biscuits, they each got one large biscuit and some stashed away for another special occasion. Anna sent some local Provincetown Taffy, she was worried that the heat would melt them, but rest assure Anna they made it in perfect shape and they were the first item I tried out of the box. Yummy. I love Taffy. I ate a few pieces, then, stashed the rest for a day I really need a candy fix. I have a feeling they will make a good snack during our next stay at home movie date. Confession: I stashed all the pink ones for me, they are my favorite. Shhh. Cape Cod Crunch, where have you been all my life? Oh yeah, in Cape Cod. See this proves my point about traveling to all the states, I need to find gems like this. I see a granola, fruit and yogurt parfait coming soon. Now this really intrigues me, I cannot wait to give this a try. I always try to do a Meatless Monday Meal and this looks perfect for a flavorful Tofu dish. I need to spice up my tofu meals, I have making the same grilled and baked tofu dishes all summer, so I am needing and looking forward to a change. I’ll be sure to post about it. Anna sent her favorite salsa, it’s Southwest Style Salsa, Mild Flavor and All Natural, which I love, plus it has black beans in it, bonus. I think this will be perfect for my Crock-Pot Chicken Tacos. I love shortbread cookies and love getting them at Christmas Cookie Exchanges. So I was really excited to try this savory flavor. All’s I can say is it did not disappoint. Wow, it was terrific. Salted Rosemary. Amazing combo. I found them on-line and cannot wait to place an order for these cookies and a few others that sounded too good not to try. They are made by Lark Fine Food, so if you’re looking for a wonderful adult cookie, they have several varieties to choose from. I also think these are going to make great gifts for the holiday season. Now to the Jams. Anna and her husband have a business and make and sell these at the Farm Market. She sent a Tomato Jam and A Cherry Jam. I have never tried Tomato Jam and Anna said to use it like you would ketchup. Their Company is Little Bay Jams. How cool is that? As for the Cherry Jam, look out almond butter you’re gonna meet a jam that will blow your crust off! It was instant love, this Cherry Jam is darn tasty. I loved the sweetness of the cherries and it spread so nice. Well Anna, thank-you so much for a great box of local food items, and for the homemade jams and card you made, you really did a great job of making this Foodie Pen Pal, One Happy Gal! Plus I just love your blog and all the creative cards ideas that you post, plus the bonus of having the opportunity of watching the craft unfold on YouTube is priceless. Thank-you my Cape Cod Friend. I sent my August Foodie Box to Meghan over at A New Adventure. Go on over and visit her blog, she has some really great posts that I really enjoyed reading. One of her posts was on making Parsnip Fries. They look amazing. Hey Fellow Foddie Pen Pals, let’s help Lindsay spread the word on the Foodie Pen Pal Program and all Tweet about our Boxes! Don’t forget to use the hashtag #foodiepenpals.